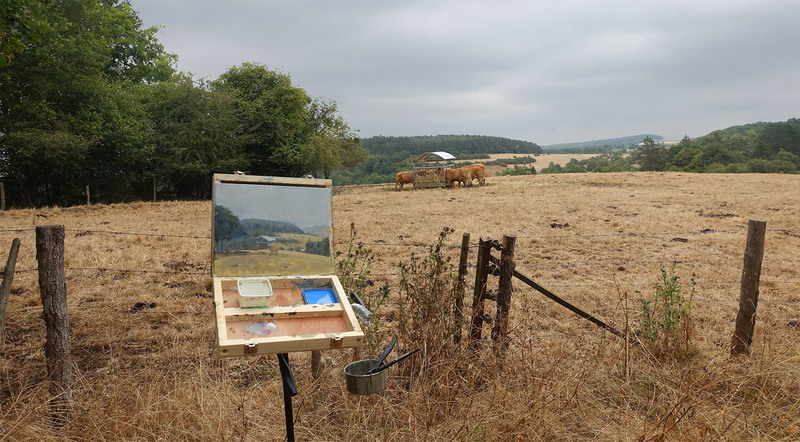 A week ago I took some time to go painting outside while I was in the Ardennes (a region south-east in Belgium). It was the perfect place to practice my analogue painting skills. If you don’t know, I recently started working with oils. In total I was able to make two paintings on 24cm x 30cm canvases. They’re quite cheap and low in quality but they’ll do for now. I’m looking into buying other formats for my next paintings as well, so should you have any tips on that, please let me know! 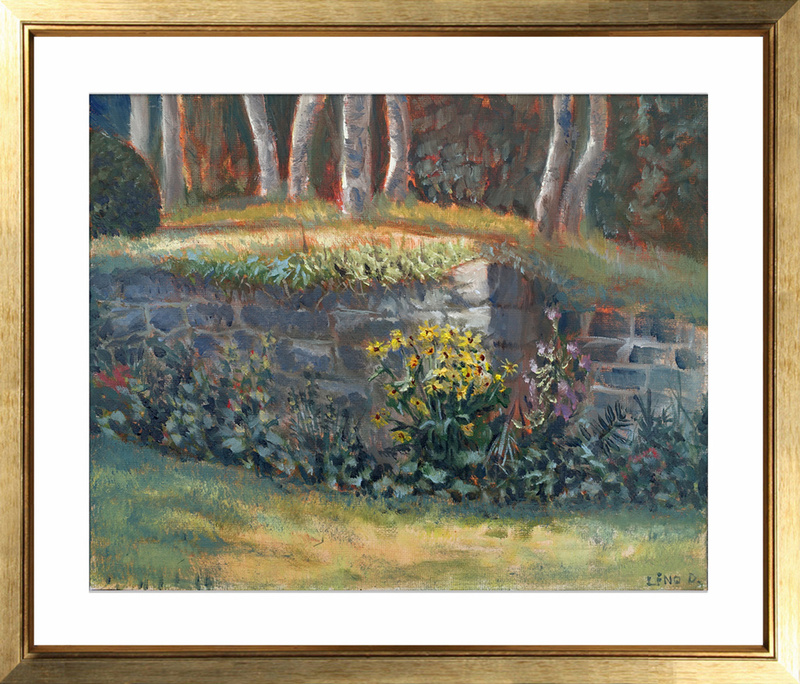 The first painting was done in the sunny noon. I was captivated by the light on the sunflowers in contrast with the cooler shades surrounding it. I started with an underpainting of a diluted Burnt Sienna to block in my composition together with the light and shadow patterns. I gave it some time to dry and I was quite happy how it turned out in the end. Starting with an underpainting gives me a good starting base to continue blocking in my colors in the later stage. It was overcast and raining lightly when I sneaked outside for my second painting while my baby-daughter was fast asleep. Don’t worry, there were still some adults back home to take care for her! Because she sleeps around two to three hours at noon, I had a limited time frame to finish my paintings. The ‘thing’ came to me when I saw cows grazing on the open meadows. The green of the trees and brown of the fields gave nice color contrasts (you have to know, all the meadows in Belgium turned brown because of the extreme sunny weather). 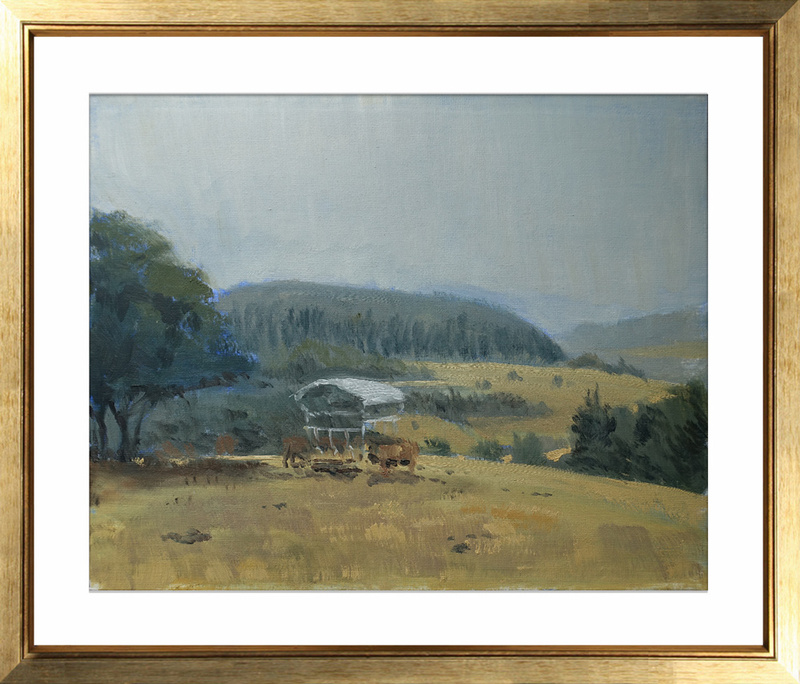 I installed my gear and started with an underpainting using a diluted Ultramarine Blue. I messed up my underpainting though -I felt nervous because of the rain and being under a tight deadline. I had time until my daughter woke up-. Luckily I was able to fix the composition and I’m still quite happy how it turned out. After a good hour and a half I got a text my daughter was awake -time for some family quality-time!-, so I cleaned up and went back home. I’m hoping to take this one into Photoshop and do an overpaint of it soon!